Eicosanoids are potent chemical messengers that play critical roles in immune and inflammatory responses. 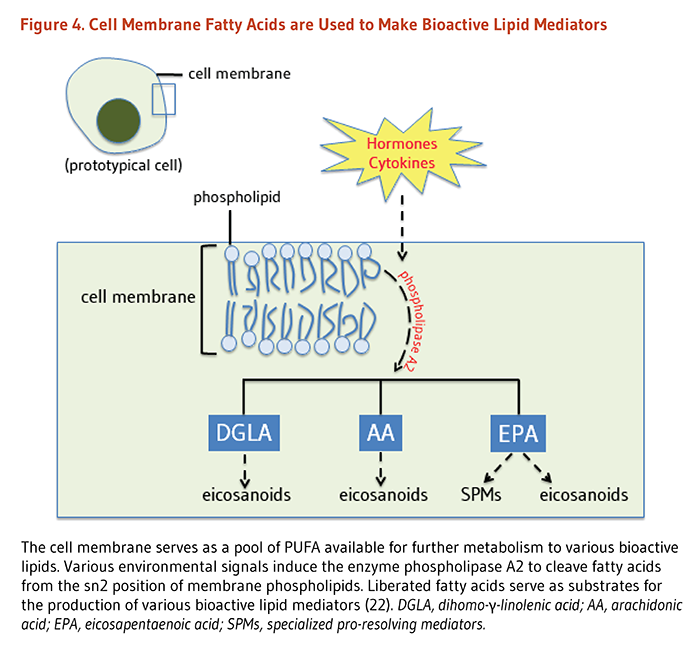 The term ‘eicosanoid’ encompasses numerous bioactive lipid mediators that are derived from 20-carbon LC-PUFA. Following stimulation by hormones, cytokines, and other stimuli, DGLA, AA, and EPA are released from cell membranes and become substrates for eicosanoid production (Figure 4). Eicosanoid synthesis relies primarily on three families of enzymes: cyclooxygenases (COX), lipoxygenases (LOX), and cytochrome p450 mono-oxygenases (P450s) (22). From 20-carbon lipid precursors, COX enzymes produce prostaglandins, prostacyclins, and thromboxanes (collectively known as prostanoids); LOX produces leukotrienes and hydroxy fatty acids; and P450s produce hydroxyeicosatetraenoic acids (“HETEs”) and epoxides. Physiological responses to AA-derived eicosanoids differ from responses to EPA-derived eicosanoids. In general, eicosanoids derived from EPA are less potent inducers of inflammation, blood vessel constriction, and coagulation than eicosanoids derived from AA (23). Nonetheless, it is an oversimplification to label all AA-derived eicosanoids as pro-inflammatory. 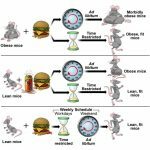 AA-derived prostaglandins induce inflammation but also inhibit pro-inflammatory leukotrienes and cytokines and induce anti-inflammatory lipoxins, thereby modulating the intensity and duration of the inflammatory response via negative feedback. Although humans and other mammals can synthesize saturated fatty acids and some monounsaturated fatty acids from carbon groups in carbohydrates and proteins, they lack the enzymes necessary to insert a cis double bond at the n-6 or the n-3 position of a fatty acid (1). Consequently, omega-6 and omega-3 fatty acids are essential nutrients. 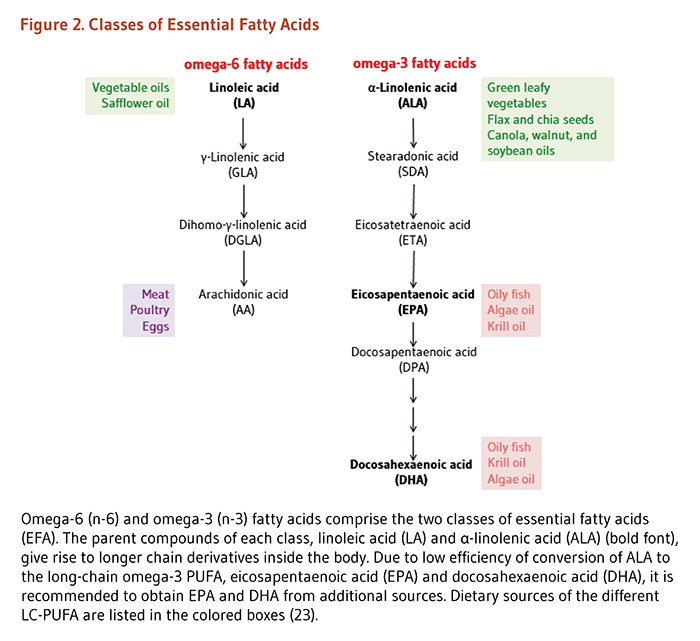 The parent fatty acid of the omega-6 series is linoleic acid (LA; 18:2n-6), and the parent fatty acid of the omega-3 series is ALA. 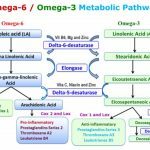 Humans can synthesize long-chain (20 carbons or more) omega-6 fatty acids, such as dihomo-γ-linolenic acid (DGLA; 20:3n-6) and arachidonic acid (AA; 20:4n-6), from LA and long-chain omega-3 fatty acids, such as eicosapentaenoic acid (EPA; 20:5n-3) and docosahexaenoic acid (DHA; 22:6n-3), from ALA. Blood concentrations of fatty acids reflect both dietary intake and biological processes (3). 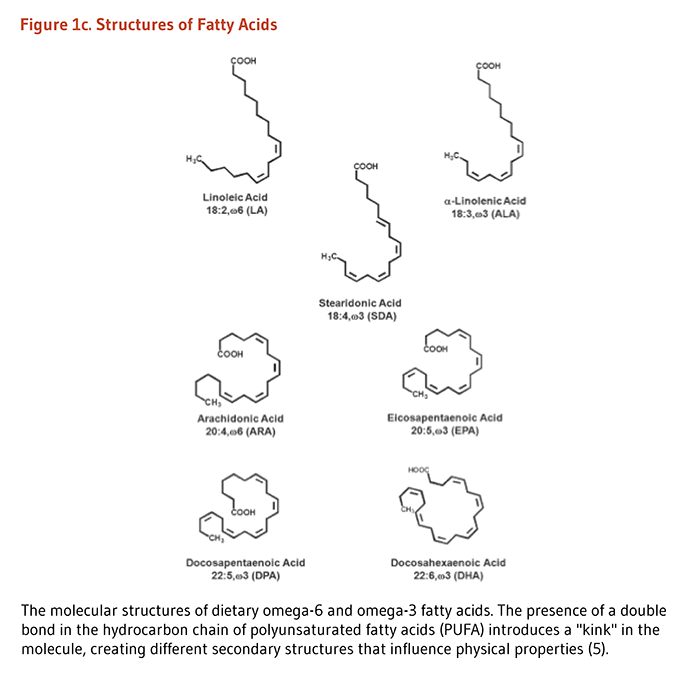 Humans can synthesize longer omega-6 and omega-3 fatty acids from the essential fatty acids LA and ALA, respectively, through a series of desaturation (addition of a double bond) and elongation (addition of two carbon atoms) reactions. LA and ALA compete for the same elongase and desaturase enzymes in the synthesis of longer polyunsaturated fatty acids, such as AA and EPA.